We have talked in the past about how economics does not cite other fields much (see Pieters and Baumgartner, 2002). Are authors rewarded for writing papers this way? In social science, the answer seems to be yes. The question we ask is simple: given the proximity in subject area between a citing publication (paper or patent) and cited publication, what is the impact of the citing publication? If cross-disciplinary information flows result in greater impact, one would see a negative correlation between proximity and impact. On the other hand, if it is within-discipline contributions that are most easily recognized and rewarded, one would observe a positive correlation. 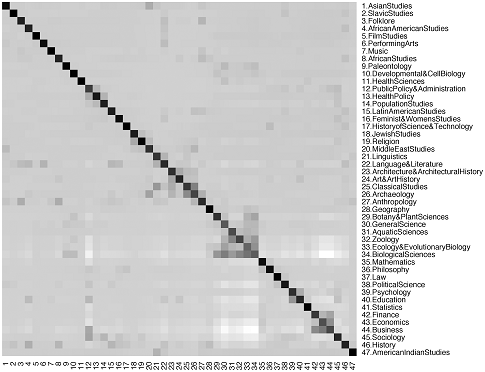 We find that a publication’s citing across disciplines is tied to its subsequent impact. In the case of patents and natural science publications, those that are cited at least once are cited slightly more when they draw on research outside of their area. In contrast, in the social sciences, citing within one’s own field tends to be positively correlated with impact. Social science does not reward citing outside the field was written on October 12, 2016 and filed in Research News.